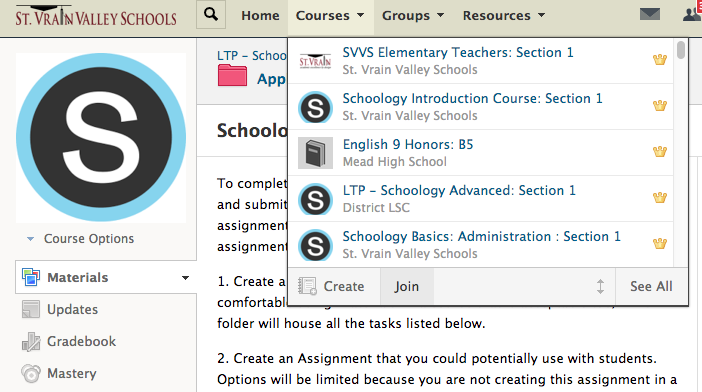 Schoology is the SVVSD Learning Management System. The primary function of an LMS is to get digital information from the teacher out to the student, and from the student back to the teacher. So, think assignments, quizzes, tests, discussion boards and so on. Schoology can do a lot more than that, but that is a good place to start. As a substitute in SVVSD you have staff member Schoology account. You log in (instructions here) with your district credentials and use the account join OPD classes that use Schoology, view information as a parent if you have a child that attends SVVSD and potentially use it for access to the course of the person you are subbing for. If a teacher wants you to have access to their Schoology course(s) they would need to provide you with the ‘Access Code’ for each course. This 10 character code found in the green box on the left hand menu of a course. If you join this way you will be a ‘member’ or ‘student’ of the course by default. If the teacher wants to add a substitute to the course permanently, they need to make them an admin of the course. The association with this course will only last until the next morning if they are not made admins. Infinite Campus will kick you out of the course when it updates over night if the member is not made an admin. If you need to join multiple course you would need to enter multiple codes. 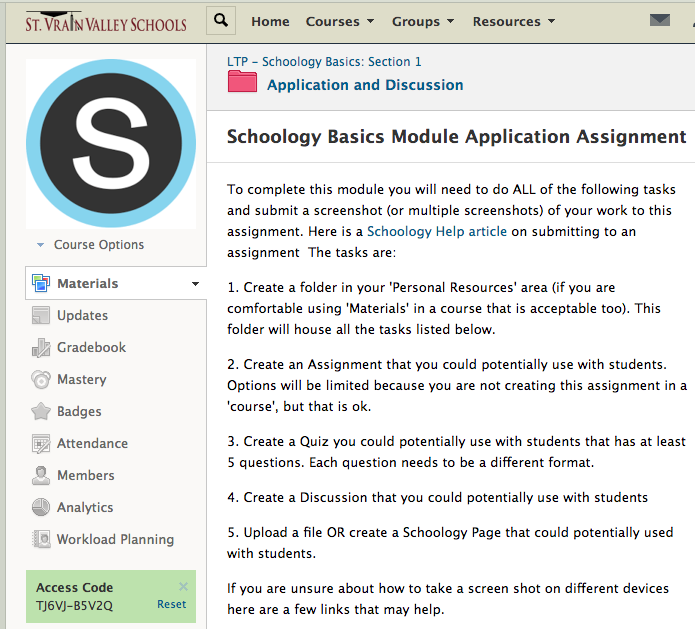 To join a course log in to Schoology, find ‘Courses’ in the top menu, and then ‘Join’. Enter the code and you will be in. Or, if you are seeking district credit take the LTP Schoology Basic Module and earn credit through OPD. (Look for LTP Modules at the top of the catalogue). Also check out Schoology on YouTube and the Schoology Help Center.